Historic Grove City Town Center is filled with friends and family honoring Ohio men and women who gave their lives in service to our country, as Grove City presents Ohio Flags of Honor. At the Grove City Wine and Arts Festival, attendees are not limited to just drinking wine and viewing art. Thirty-thousand patrons typically enjoy the experience of the festival’s two titular highlights, along with a host of other entertaining aspects. But festival organizers work each year to present interactive opportunities, and this year, those opportunities are growing significantly. “Each year, we try to work on more (opportunities) for the experiential part of it,” says Andrew Furr, Heart of Grove City executive director. The 2019 festival, taking place in historic Grove City Town Center, is set for June 14 and 15. Heart of Grove City has worked with local arts organizations to offer hands-on activities. This year, possible activities include painting with local business, as well as glasswork through Glass Axis; the organization that in the past has offered patrons the chance to sit down with a hot torch and make glass beads. It’s not just the festival’s art component that will have hands-on activities – or, to coin a phrase, feet-on activities. Heart of Grove City has also been working with the Ohio Wine Producers Association to coordinate a grape-stomping activity, as well as other possible grape-related endeavors. Charting the festival’s growth is impressive. The first Wine and Arts Festival, in 2012, had eight wineries and 14 artists. This year, the final tallies are expected to top 20 wineries and 70 artists. “Each year, it’s continued to grow, and we are reaching our maximum as far as our space allowances go,” says Furr. There are no plans to seek out other locations in the immediate future, he says. The wine component of the festival hasn’t just grown in numbers; it’s also grown in variety. Soine Vineyards, based in Powell, has a lot of dry wines, and has seen its stock rise at the festival in more recent years. Akron-based It’s Your Winery is a popular choice as well, Furr says, with people making a point of seeking it out. And, of course, Grove City’s own Plum Run Winery is always a big hit. The 2019 artist line-up is not yet official – it’s typically announced in late April, with applications accepted through March 31 – but, as always, the festival’s jury is working to bring in a mix of artistic media. Some of the recent favorites have included a watercolor painter and a local wrought iron worker, and the selection committee always makes sure the roster includes local artists. 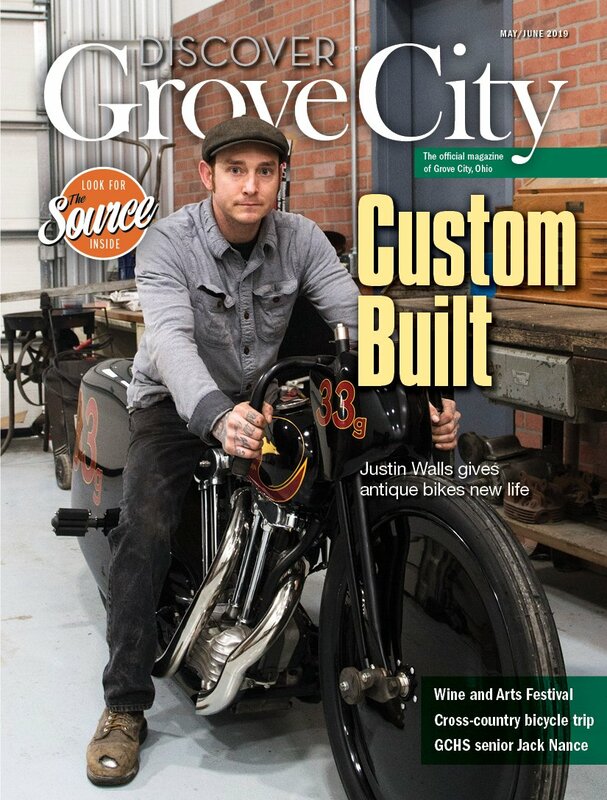 “There are quite a few Grove City artists who make the cut,” says Furr. The Grove City Arts Council always buys two or three vendor spaces at the festival to showcase its members’ work. The festival represents a great chance for members to get their work in front of a large and receptive audience, says Dennise Hunt, vice president of the Arts Council. Artistic media exhibited by members include paintings, oil, watercolors, jewelry, metal works, enamels and photography. “We get new members all the time, and a lot of the time, it’s their first opportunity to show their work publicly,” Hunt says. The last few years, the Arts Council has brought in a portrait artist for the amusement of festival patrons, and this year, it’s working with students from the Columbus College of Art & Design to rotate artists for more portrait opportunities. “(Patrons get) their kids’ portraits done, or they get portraits of themselves and their children,” Hunt says. “We have a nice mix, from comfort food to high-end,” Furr says. As the festival continues to grow in size and popularity, organizers make a point each year to find as many ways as possible to promote the businesses in Grove City’s downtown area. That’s a top priority at all Heart of Grove City events, Furr says.